Now that I’m finished with university, I’ve been talking to a few people lately about the ‘good old days’ of modding — how we first met, etc. 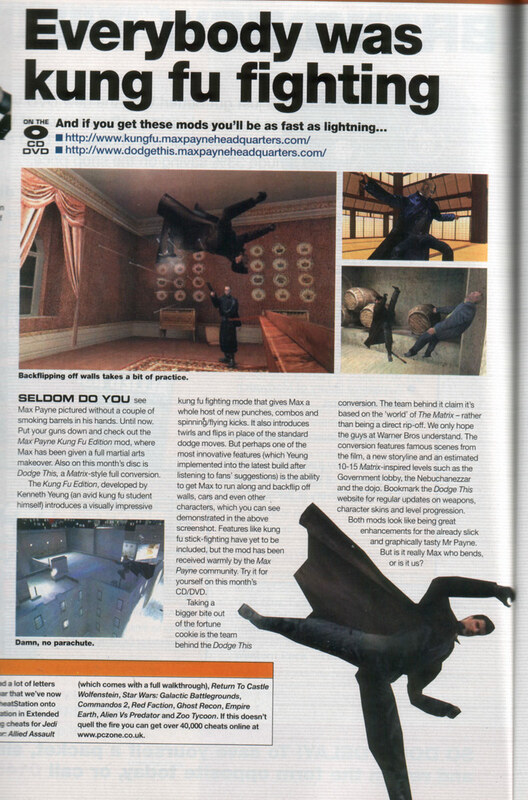 Anyway, while searching gaming magazines for my portfolio, I stumbled on the original article which got me interested in the Max Payne modding scene in the first place. The contents shouldn’t be of any great surprise – Kung fu and The Matrix (Dodge This to be precise). It’s hard to explain the effect this article had on me. I’d vaugely heard of Max Payne from friends at college (according to them, it wasn’t very good :P), and I was a big Matrix fan. So the idea of making Matrix style levels with Bullet Time and now ‘Kung Fu’ sounded too good to be true. Bear in mind, my previous game design experience was tile-based Qbasic games (simple RPGs, etc), and very basic Duke3d maps — all on a 486 (I only got my ‘new’ pc a few months before this article). I guess that screenshot of Morpheus jumping across the rooftops (bottom left) just ‘did it’ for me. Within a month I had bought the game, torn my hair out trying it working, run through the MaxED & milkshape tutorials, and joined MPHQ and 3drealms.